Usually, when I have friends over, I try to bake something nice for tea. This time I was really struggling and had no idea what to do! I had been feeling under the weather with a stubborn throat pain that never seemed to go away, no matter what I did. I really didn’t feel like baking at all. Honestly, the thought of a warm cozy bed was all I could think of! However, I had promised a friend I would help her plan her imminent trip to my country, Portugal. So I took a few cooking books and started browsing. I rejected many recipes for being too complicated in my state, for being plain bad, not interesting, for not having all the ingredients, you name it! I was about to give up, admit defeat and serve God forbid, some store bought cookies when I came across this wonderful Chocolate mini Muffins recipe. My throat pain almost disappeared with my excitement! It was everything I was looking for. It had chocolate (a must when I’m feeling sick! ), the muffins were small enough not to make you feel guilty later, it had few ingredients and above everything, it was so easy to execute. As the recipe has very little flour and no baking powder, these muffins are smaller. It is completely normal. Instead of regular sugar I used brown sugar and loved the taste. The muffins are supposed to still be moist in the center when you take them out of the oven. They are such a treat that you will want to eat them all! This of course will defeat the purpose of not feeling guilty about eating such small muffins. It is a recipe adapted from the Mexican chef Monica Patino. Preheat the oven to 150ºC/300ºF. Line the muffin pan with paper cups. Break the chocolate into pieces and melt it in a heatproof bowl over a pan of simmering water. Add the butter to the chocolate and mix well until smooth and creamy. Remove the bowl from the heat and pour the batter into a large bowl containing the sugar. Mix it very well until the sugar is dissolved. Then add one egg at a time and beat until well combined. Sift the flour and fold it into the batter until well incorporated. Pour the batter into the moulds until they are about half full. Bake for 10 to 15 minutes. As I live in high altitude, it took me a bit longer, about 2o to 25 minutes. Make sure the center is still moist. Remove them from the pan and let them cool down before you sprinkle them with icing sugar. 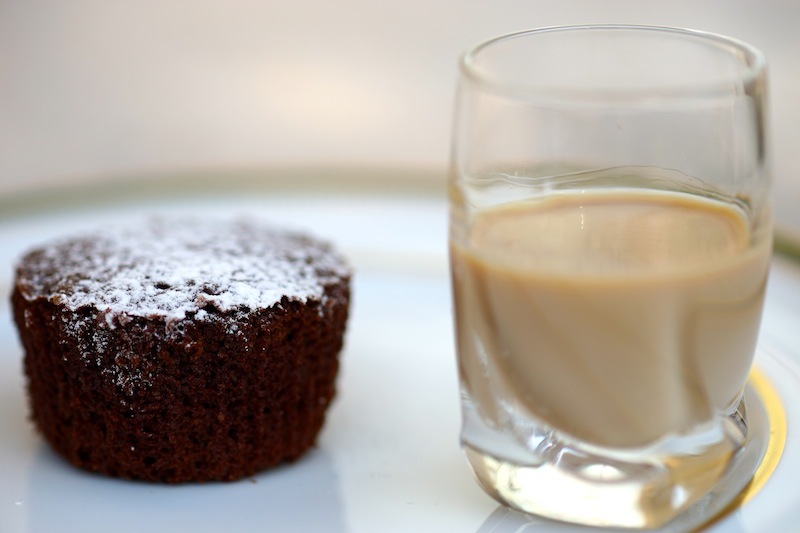 It is suggested to serve the muffins with a coffee liquor like Baileys with a dash of evaporated milk. My husband came home from a work related trip and was served the last two muffins. Afterwards, he just looked at me in a special way and asked me if I thought he was going far with just two muffins. Needless to say he convinced me to do another batch! 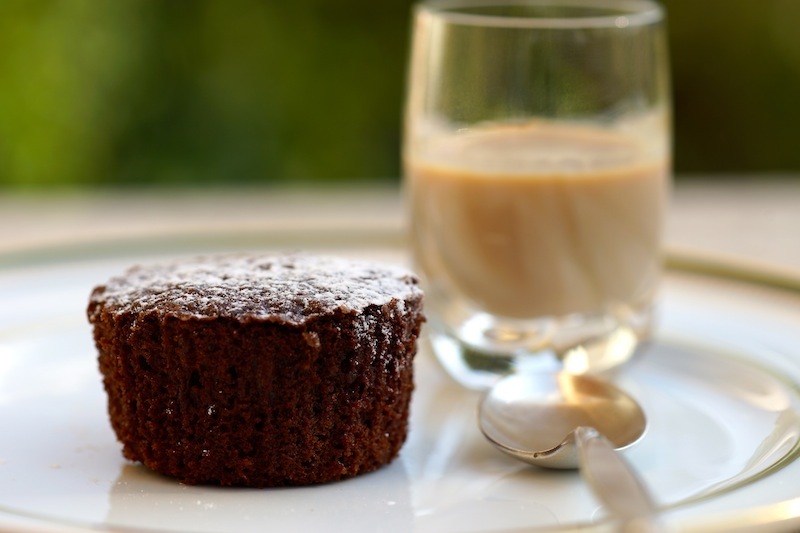 The Chocolate mini muffins are really moist and soft, take very little time to make, are so easy and delicious! These mini muffins are delicious and after baking them all the family enjoyed eating them!